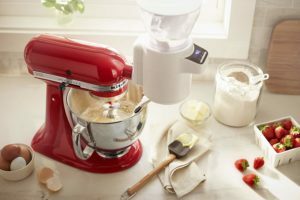 KitchenAid KSMSFTA Sifter + Scale Attachment 4 Cup is now available at Amazon.com for just $85.99 (REG $169.99) (As of 22 March 2019, 20:45 PST – Details) with $84.00 (49%) Savings. 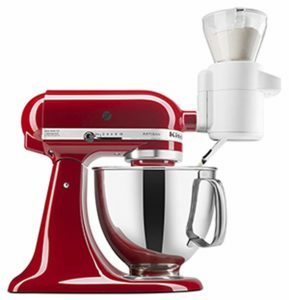 Simply attach the Sifter + Scale Attachment to the power hub of any KitchenAid Stand Mixer. 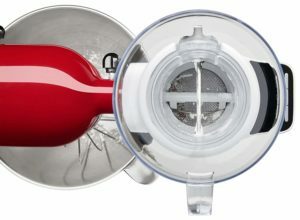 Then experience hands-free sifting as the sifter gradually incorporates ingredients into the mixer bowl. Battery operated scale. 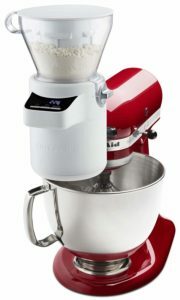 Hands-free sifting gives more consistent mixing and fluffy baked goods, and saves time during the process. Generous capacity hopper holds up to 4 cups of dry ingredients at a time. All parts except scale and sifter housing are dishwasher-safe..
Model KSMSFTA includes (1) Digital Scale, (1) Ingredient Hopper, (1) Removable Sifter, (1) Sifter Housing, (1) Swivel Chute, (1) Scale Accessory Plate. 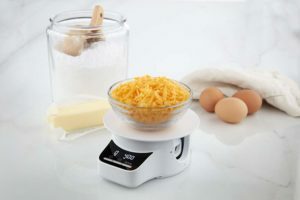 Quickly and easily achieve fluffy, consistent results with the revolutionary Sifter + Scale Attachment – the all-in-one baking tool that accurately measures, thoroughly sifts and automatically adds ingredients directly to your mixer bowl in just one step.